Rural folk have always been known for their ability to make what they needed, using the materials and tools at hand. The hand-made furniture, clothing and signage of the farm and cabin may be ‘rude’, ‘awkward’ and ‘rough’, but they also hold a simple beauty that is lacking in their highly-designed urban counterparts. The term ‘rustic’ can be used in a patronising way. At the same time, a growing public knowledge of environmental issues has resulted in a greater respect for ‘rural-style’ and ‘reclaimed’ products. Urbanites with little or no concept of hand-work are willing to pay good money for table made from an old barn door, or a sign painted onto a rusty truck hood. In centuries past, county people longed for the sophisticated wares of the city, but today the tables have turned. As the world’s population has become more urbanised than ever, ‘rural’ products have become ‘exotic’ and sought-after. Rustic signage has truly come into its own. Gift shops have - in turn - filled up with cheap ‘rustic signs’ imported from Asia. Displaying shamelessly squashed sans-serif fonts, and motivational sayings, these so-called ‘rustic signs’ are about as authentic as a plastic cowboy hat. On the other hand, even well designed and handcrafted wooden signs require a fair amount of maintenance to keep them looking good. In the Southern United States and Australia, termites (also known as ‘white ants’) can quickly eat a timber sign hollow. Harder types of wood tend to last longer, but all woods succumb to the elements. Given time water seeps through the protective paint causing cracking, splitting, warping or rotting. Regardless of the type of wood, the UV in sunlight makes quick work of even the toughest clear finishes. So even signs that are designed to look 'weathered' begin to fall apart and go beyond the desired 'rustic effect'. 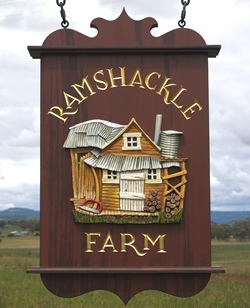 For this reason, a growing number of rustic-sign makers - including us – have taken to using wood alternatives, and carefully artist grained faux-wood finishes. At Danthonia Designs, we use a material called High Density Urethane or HDU for short. 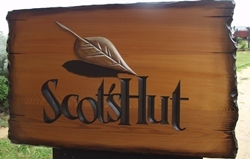 HDU is a closed-cell foam that can be carved and finished just like wood, while requiring none of the labour-intensive maintenance of wooden signs. We find this to be the best solution, both for the trees and for our customers. Being a bit ‘plain and simple’ ourselves, the rustic signage we produce certainly has the rural style to it, but with a touch of class. It also lasts a whole lot longer than the cheap softwood signs.